This book is an introductory text on real analysis for undergraduate students. The prerequisite for this book is a solid background in freshman calculus in one variable. The intended audience of this book includes undergraduate mathematics majors and students from other disciplines who use real analysis. Since this book is aimed at students who do not have much prior experience with proofs, the pace is slower in earlier chapters than in later chapters. There are hundreds of exercises, and hints for some of them are included. Contents: Sets, Functions, and Real Numbers Sequences Series Continuous Functions Differentiation Integration Sequences and Series of Functions Readership: Undergraduates and graduate students in analysis. 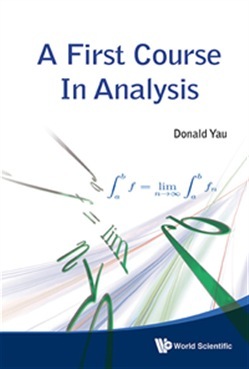 Acquista A First Course in Analysis in Epub: dopo aver letto l’ebook A First Course in Analysis di Donald Yau ti invitiamo a lasciarci una Recensione qui sotto: sarà utile agli utenti che non abbiano ancora letto questo libro e che vogliano avere delle opinioni altrui. L’opinione su di un libro è molto soggettiva e per questo leggere eventuali recensioni negative non ci dovrà frenare dall’acquisto, anzi dovrà spingerci ad acquistare il libro in fretta per poter dire la nostra ed eventualmente smentire quanto commentato da altri, contribuendo ad arricchire più possibile i commenti e dare sempre più spunti di confronto al pubblico online.